Remember when I made the Fried Ice Cream Cake? I've been thinking of making a chocolate version of it for a while but I couldn't figure out what to use to make a crunchy crust and topping with. And then I remembered Magic Shell. You know, that chocolate sauce that firms up when it hits something cold?! Perfect! And let’s go ahead and talk about the fact that this isn’t actually a cake (and neither was the Fried Ice Cream Cake). I did make it in my cake pan and it does look like a sheet cake and it does cut like a cake. So, that works for me! If this causes you to lose sleep at night, you can just pretend I called these Ice Cream Desserts! M’kay? I made this for my mama’s birthday this weekend and it was a huge hit! This is super easy to make and really delivers a “wow” factor so it’s perfect if you’re looking for something special that’s not too difficult or fussy. The cool whip causes the “cake” to have a softer, more whipped texture than just plain hard ice cream and the crunchy Oreo bits give it a nice contrast in texture! I’m going to reference some of my instructions from the Fried Ice Cream Cake because, well, they just make sense…Set ice cream out to soften up at room temperature for about 30 minutes. Or longer if your freezer is set on 'Cryogenic Clone Storage'. You want to be able to slide a butter knife into it without too much resistance. Meanwhile, crush Oreos in a large bowl (I gave AB a meat mallet and let her go to town). Shake Magic Shell and pour both containers into bowl with crushed Oreos and stir well. Close Magic Shell containers tight then turn upside-down and set aside (there’s still a good bit left in the containers that you’ll use later to drizzle on top of the cake). Spread half of the Oreo mixture evenly over the bottom of a 13x9 baking pan. If you have to use a little more than half to get it to stretch, that’s OK. Place pan in the freezer for Oreo layer to firm up. In a stand mixer, using the paddle attachment, or large bowl using big ole spoon, mix ice cream and cool whip just until thoroughly combined. 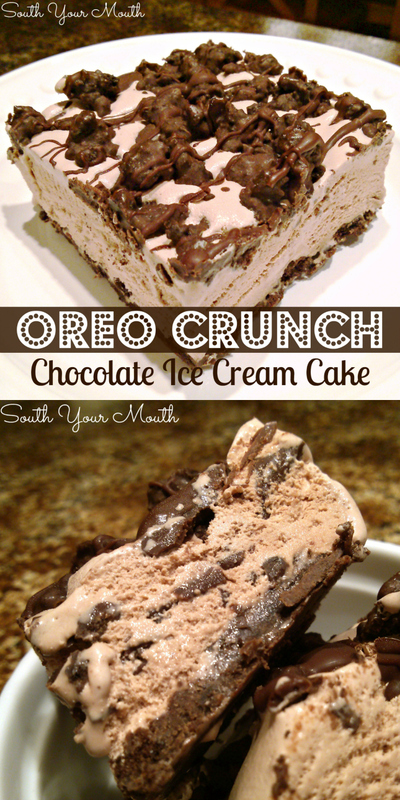 Grab the pan out of the freezer then spread the ice cream mixture evenly over the Oreo layer. Sprinkle top of ice cream layer evenly with remaining Oreo mixture. Drizzle remaining Magic Shell evenly over Oreo mixture. Cover and return to freezer. Freeze “cake” for 6-8 hours before serving. Looks way good enough to eat! This may be my birthday treat this year - thanks for sharing! Do you think it could be vanilla ice cream? Want to make for a birthday dessert. My husband loves oreos, but not too much chocolate. I made this the other day with vanilla ice cream and it was wonderful. My kids would definitely love it. Question ~ made this today for my son's birthday. It was really good HOWEVER, the entire bottom crust was stuck to the bottom of the baking pan...:( So we only tasted the top oreo/magic shell mixture. Where did I go wrong? Thanks! I don't know! Maybe it had to do with the type of pan? I used a metal pan. Let me know if you used glass. Maybe that's the difference. If so, I'll need to note that in the recipe. Glad y'all enjoyed it anyway but I hate to hear it wasn't perfect. Especially since it was your son's birthday cake!